Hi, I am interested in your 2004 Chevrolet SSR (stock #4685-ATL) listed on Autotrader for $29,995. I'd like to get more information about this vehicle and confirm its availability. This 2004 Chevrolet SSR combines the option of open-air driving with cargo capacity you just wont find in any passenger car. Whether you get a hankering to take a cruise on the open road with just blue sky above you or dutifully answer the call to help a friend move, this car has you covered. Its only logged a little over 28,000 miles, so its just now entering its prime and carries its service history on board to attest to the good care its received over its lifetime, along with a clean CarFax report to prove its been steered clear of any trouble. Its vibrant red paint really makes this Chevy stand out - its in great shape and offers a consistent, wet-looking shine from front to back that suggests a history of regular sheltering when not in use. You cant help but notice the styling on display here - SSRs really bear no resemblance to anything else on the road and their prominent front grille and fenders as well as their sizable running boards are actually an aesthetic homage referencing all the way back to Chevys Advance Series trucks - able workhorses that plied their craft as the country entered the post War construction boom of the late 40s to mid-50s. Along with its distinct look comes a level of functionality you wont find on any other car or truck - we may see vehicles with their tops modified or removed entirely, but with a flick of a switch this SSR can take you from a sheltered hard top environment to full-on open air cruising. Their exteriors may reflect a vintage inspiration, but SSRs feature thoroughly modern, stylish and well-equipped interiors. The one on hand here sports a pair of fresh-looking black leather bucket seats with integrated headrests that straddle a contrasting red center console. Theres no shortage of comfort and convenience features either - youll find that not only are those bucket seats heated for comfort, but cruise control, power windows and door locks, a tilting column and air conditioning that runs at the top of its game are all present and accounted for. The dash area still appears strong, with its assortment of gauges clear and readable and surrounded by brushed aluminum trim still looking good - another sign of this SSR being kept out of range of UV exposure. An AM/FM/CD stereo player sits at the center and combines with Bose speakers to handle your audio needs. That truck bed in back is no mere novelty - it offers a surprising amount of room. Theres plenty of power under the hood to make for exciting driving. A fuel-injected 5.3 liter V8 sits in the very clean engine bay and is good for a full 300 horsepower. Just as youd expect from the engines light mileage and attentive care, its in great shape, firing right up and pulling with conviction as it teams with a 4-speed overdrive transmission to make the SSR equally at home on boulevard and highway. Its got a lower profile than any unmodified pickup youre likely to come across and, and when you factor in its fully independent suspension, its agility is very much on a par with its versatility. Four wheel anti-lock power disc brakes bring it to a stop in short order, while driver and passenger airbags provide an added measure of safety should the unforeseen ever happen. This inspired merger of car and truck rides on a set of stock Chevrolet aluminum rims wrapped with Goodyear tires. Luxurious comfort, strong acceleration and appreciable hauling capacity to boot! 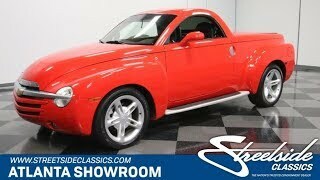 This 2004 Chevrolet SSR is one seriously versatile vehicle. Call today!